“The frustrated musician in me has come up with ways of silently learning music while stuck at my corporate desk. I studied Indian classical music for a while and have internalised two of their rhythmic systems. Indian approaches are abstract, numerical, and non-written, and so open up ways for me to silently and invisibly practice in my head. The trailblazing choreographer returns to his roots, curating Darbar Festival’s Indian classical dance programme at Sadler’s Wells later this month. He discusses this off-stage role with Darbar’s George Howlett, along with how classicism can be experimental, and why reconnecting with nature must be physical. As a teenager, Akram Khan toured the world as part of Peter Brook’s eight-hour production of the Mahabharata. Each evening he would immerse into the ancient Indian epic, exploring themes of love, family, and war alongside sweeping visions of the cosmos. The work depicts the struggles of two noble families who vie for the throne of Hastinapura. They disagree about the proper line of succession, and their intergenerational feuding shrouds the world in darkness. Khan sees the opposite phenomenon at work in today’s Indian classical dance world. For him, classical forms shine brightest when examining their own boundaries, and pushing the margins of what is considered ‘proper’. He knows that classical arts must experiment to survive, but acknowledges that innovating with traditional ideas is a fine balancing act. Modern experiments can miss the deep knowledge of the past, but ancient forms that stay too ancient are consigned to the history books. Khan has always lived at the confluence of these tensions – classically trained, but not a classicist. This year he is curating Darbar Festival’s dance programme, inviting some of his favourite artists for a three-day takeover of Sadler’s Wells (23-25 Nov). How does he choose what to represent? Khan’s own roots are in kathak, and his choreography has never become unmoored from the style’s core characteristics – fluid spins, intricate hand gestures, and periods of calm punctuated by bursts of densely mathematical footwork. He has entrusted Sangeet Natak award winner Gauri Diwakar with representing it at Darbar. She will perform Hari Ho…Gati Meri (“Let my salvation be in the supreme”), a modern four-part solo work tailor-made for her by Aditi Mangaldas. Elsewhere in the programme, bharatanatyam explorers Renjith Babu and Neha Mondal Chakravarty will use subtle eye movements and striking limb geometry to evoke different incarnations of Shiva and Kali. Their unusual jugalbandi duet draws on yoga and ancient martial arts, balancing creation and destruction over Carnatic vocals and a live orchestral score. Mavin Khoo, its choreographer, will also be leading a bharatanatyam improvisation workshop, open to observers and participants. Odissi dance can trace its roots back over two millennia, to carvings in the Manchapuri caves and descriptions in Sanskrit aesthetic treatises. It was suppressed to near-extinction under British rule but has since enjoyed a resurgence, adding theatrical elements to a core of sinuous postures and energetic jumps. Award-winning modern exponent Sujata Mohapatra will walk a rhythmic line between dance and drama at Darbar, dissolving character into shape with sensuous poise. India has played host to deep cultural interchange for centuries, and its classical arts have always been in flux. They blend colour from multiple waves of history – Vedic metaphysics, Hindu rituals, Islamic colonial patronage, and English terminology. Khan is drawn to the places where these roots intertwine, pointing out that Mangaldas’ kathak piece is based on Muslim devotional poetry to Lord Krishna, a Hindu deity. Indian classical dance is a global phenomenon now too, with plenty of innovation occurring outside the subcontinent. Bharatanatyam originated in Tamil Nadu, but Khoo is a Malaysian who trained in Britain and the USA as well as India. Others look elsewhere in the world, with Kiran Rajagopalan fusing Indian and West African ideas in New York last month. Newcomers to Indian classical arts often enter expecting a reverent atmosphere, and leave surprised at the sheer playfulness of the performance. Hindustani musicians will twist and stretch each other’s phrases, and kathak exponents are masters of mime, transforming into peacocks, demons, and many-faced gods at a moment’s notice. There is something refreshing and childish going on, as if witnessing a return to our most basic human impulses. Choreographers combine the playful and cerebral, contrasting these mime-like expressional movements (abhinaya) with those embodying ‘pure form’ (nritta). A dancer may impersonate a flock of birds, then use rapid-fire footwork to tease new tensions from a 14-beat rhythm. Khan credits Indian classical music with first opening his eyes to mathematics, and is drawn to kathak’s interlocking numerical patterns (perhaps a logical inclination is in his genes: his grandfather was a prominent Bengali mathematician). But he doesn’t see it as an abstract mode of engagement: “I had a natural impulse to search for sequences in the world around me, and ‘take things apart’ as I learned them”. Darbar Arts & Heritage believes in the power of Indian classical music to stir, thrill, and inspire. To find out more, sign up for the Darbar newsletter or explore their YouTube channel. Debashish Bhattacharya is both a radical and a traditionalist. His self-designed slide guitars breathe new colours into ancient Hindustani ragas, and he has taken them around the globe, collaborating with musicians from Hawaii to Okinawa. He catches up with George Howlett to discuss instrument creation, the hidden harmony in ragas, and how listeners should appreciate the interconnectedness of the natural world. Like many Hindustani stars, Pandit Bhattacharya was born into a long cultural lineage. He traces his family back through seventy-six generations of artists, writers, and Sanskrit teachers, and represents the seventh in a straight line of musicians. He established himself early, debuting on All India Radio at the age of four, winning competitions at seven, and inventing his first slide guitar at fifteen. But his path has never been a straightforward one. He was denied a prestigious classical scholarship on the grounds that he didn’t play a traditional instrument, and just as his career was taking off he left his home in Kolkata to study with the late guitar pioneer Brij Bhushan Kabra. I get the sense that he’s always aimed to expand his own understanding rather than rebel against anything in particular. After all, anyone who designs their own instruments has to rebuild from first principles: “I created the first Indian classical guitar in 1978 at the age of fifteen. I designed it from scratch – it wasn’t a modified Western guitar. Since then I’ve introduced new elements to global slide guitar, including new tunings, fingerpicking techniques, and over 500 compositions”. Today he wields his self-designed ‘Trinity of Guitars’ – the Chaturangui, a 23-string amalgamation of sitar, sarod, violin, and rudra veena, the Gandharvi, which blends the 12-string guitar with veena, santoor, and sarangi, and the Anandi, a 4-string slide ukulele. He isn’t done yet, telling me three more creations are on the way. Elsewhere he speaks of Bach’s solo string works in the same regard. They are also streams of single notes, but nobody would see them as absent of harmonic movement. I wonder what his own take on the violin partitas would sound like? Perhaps we’ll find out – he’s been writing orchestral scores. Overall he describes himself as “an optimist and a pessimist” about the future of Indian classical, recognising that young musicians are growing up in a much faster-paced world than their forebearers. He has seen this firsthand – his daughter Anandi is an accomplished singer who releases her own albums as well as featuring on his, debuting this year with Joys Abound. Debashish plays the Southbank Centre on Sat 22nd Sep at 6:30pm, accompanied by Sukhwinder Singh’s sparkling tabla. Tickets available here (£18-50). The concert is a double-bill with violinist Praveen Sheolikar, as part of Darbar Festival 2018. See Debashish’s own website for more dates. Jungle music and Hindustani classical tabla playing have some really striking similarities. Listen to We‘s jungle masterpiece Magnesium Flares, and Zakir Hussain & Alla Rakha’s Lineage tabla duet. Both are both based around intense 16-beat percussion loops, with rapid and unpredictable drum syncopation taking up the central listening position usually occupied by melody. This is surprisingly rare in music, but is fundamental to both tintal-rhythm tabla recitals and jungle/DnB. The styles regularly hit 160-180bpm, and overall instrumental textures are similar: busy percussion in the mids, ambient harmonic colour floating in the background, and a clearly distinct level of superdeep quasi-melodic bass. The tracks above are composed of little else. That being said, there are other ways to conjure up precise images from bols – Zakir Hussain can sketch a cannon, a galloping horse, a deer searching for food, and a steam train. In fact the rela (‘rushing’) category of tabla’s core repertoire acts as an aural history of North India, aiming among other things to evoke the sounds of Colonial railways, with many compositions explicitly aiming to mimic the sound of the new technology as it spread across North India. The first tracks were laid in the 1850s, but recorded sound did not reach India for another generation – tabla’s versatile sound palette allowed the vivid new rhythms to be captured and shared. It’s also intriguing that UK Apache (jungle’s Original Nuttah MC, describes: ‘performing…[while] doing the call to prayer at my mosque in Tooting’. Although the link to tabla is not direct, it is pleasing to know that the Islamic devotional music which profoundly influenced Hindustani performance also left its mark on a bonafide jungle classic. Tabla and jungle share yet more direct similarities when it comes to physical performance. Whether the musician is positioned behind a pair of turntables or drums, they may well be playing for dancers in front of them (although raving and kathak are otherwise on opposite ends of the spectrum). At their best then both genres evoke a sense of immersive and spiritual fun, and given the similarity of their core elements then it is no coincidence that they both mix particularly well with jazz. I’ve never heard a true fusion that would complete the Jazz/Hindustani/Jungle collaboration triangle, although Talvin Singh and some of Bill Laswell’s wilder fusions have come pretty close. So I’ve had a go at laying down some Rāga Jungle, by fusing up some classic oldskool drum breaks with the kayada compositions I learnt while studying tabla under the Mishra lineage in Benares, as well as my sloppy personal variant of the South Indian konnakol language (more on this soon). Tendonitis issues and having a day job limit my own ability to become a real tabla master, but someone who can play them properly should explore this further – you will have some incredible fun. Shuffling the combined playlist also works great. This is my two cents on how to understand the endlessly fascinating rhythms of Shakti – jazz guitar legend John McLaughlin’s collaboration with the musicians of India. Their music provides landscapes you can get lost in and keep on exploring, and what I can see and describe here is just a fraction of what is there. That being said, the ideas in this article are readily translatable, and understanding them requires no prior knowledge of music theory. The original Shakti group was one of the first East-West musical fusions, and the dual-lead combination of McLaughlin’s rapid acoustic guitar and Lakshminarayana (‘L.’) Shankar’s sliding violin broke new musical ground. They also experimented with instrument construction – McLaughlin wields a heavily modified acoustic with sitar-like sympathetic strings and scalloped frets, L. Shankar went on to pioneer the 10-string doubleneck violin, and Vikku Vinayakram is credited with popularising the use of ghatam clay pot in music (what an excellent one-line biography). Along with their successor band Remember Shakti, they have a real mastery of keeping a strong groove in irregular time signatures, and not allowing high degrees of rhythmic complexity to make patterns too difficult to follow. There is one particular trick they use to achieve this – centered around accenting the ‘oddness’ of the final bar in each cycle. This emphasised final bar is often the key to how Shakti’s unfamiliar time signatures can flow even to uninitiated Western ears, as it provides a marker for when the cycle will finish and repeat over again, and so anchors us to the overall groove. Making the very end of a cycle prominent is found throughout the world of music (for example the turnaround in a 12-bar blues), but Shakti break new ground by putting this particular odd-time spin on it. The song’s title gives a clue to decoding its cycle – as well as describing the timezone difference between John and Zakir’s homes in California and India, 5 and 6 sum up to 11. The syllable groupings either side of the comma also reference the title’s own structure – ‘Five in the Morning’ has 5 syllables, and ‘Six in the Afternoon’ has 6. This, intentional or not, is dope (even though the cycle is not in fact subdivided as 5 and 6). 5 in 6’s remainder bar rhythm structure is one of many in evidence. A similar 4-4-3 cycle is used in Bridge of Sighs by the original Shakti group, and the band’s whole catalogue is full of this idea being applied to a whole host of different rhythm cycles. Ma No Pa, a Zakir composition, is a work of true genius which explores many interlocking rhythmic ideas, including a 10-beat cycle broken down roughly into a 4-4-2 (this is a beautiful game after all). The entirety of the piece showcases the electrifying three-way interaction between McLaughlin’s Western jazz guitar, Zakir’s North Indian tabla, and Selvaganesh’s South Indian kanjira, and is something special to witness. In Anna, the idea is used more subtly, and the later stages include Zakir turning the familiarity of the final bar on its head, by introducing new rhythms into the space it brings. The long composed melody of the piece establishes several distinct 9-beat patterns, before settling into a swung 3-bar pattern, with a subtler final bar emphasis. The influence of jazz can be seen more clearly here. Zakir swings over a groove familiar to Western ears and which does not contain an odd remainder, and even imitates jazz brush-kit drumming by sliding across the right-hand dayan tabla. Finally, the piece concludes by revisiting the 3-3-3-3-3 pattern, and then resolving back to the original 4-4-4-3, having constructed a symmetrical set of interdependent rhythms which allow for soaring solo phrasing from L. Shankar’s perennially breathtaking violin. This remainder-based approach is similar to thinking in modulo arithmetic, where the modulo is the remainder when dividing numbers into each other. The clearest example of counting this way is in how we read a clock face – we use a basic cycle of 12, and calculate time differences (remember them?) from the remainder. If adding 13 hours to a given time, we realise that 13 is 1 more than 12, and so use this remainder to keep time, rather than the original number itself. We may or may not notice these links and patterns consciously, but our subconscious mind will always absorb them, and these details will colour the way we hear the music even if we don’t know why. Looking at rhythm this way is underpinned by the system of konnakol – a method of breaking rhythms down into vocalised syllable patterns which comes from the ancient Carnatic classical tradition of South India. The Vinayakram family provide Shakti’s direct link to the world of konnakol – Vikku plays kanjira tambourine and ghatam clay pot in the original band, and his son Selvaganesh brings several instruments to the stage in Remember Shakti. They, along with Vikku’s father T.R. Harihara Sarma, run the Sri Jaya Ganesh Tala Vadya Vidyalaya school of rhythm in Chennai, and are probably the leading exponents of konnakol today. McLaughlin’s introduction to konnakol was however earlier than this – he studied it way back in the 70s, under the instruction of Ravi Shankar. 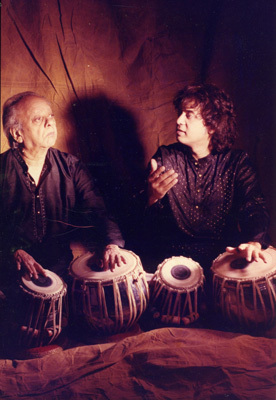 Apart from being a tantalising ‘what-if’ recording collaboration, this partnership is also interesting in that it highlights a seldom-noticed dimension to Pandit Shankar’s already illustrious legacy – he is from North India’s Hindustani tradition, which uses the tabla-based bol system rather than the South Indian konnakol. The two approaches are markedly different – although they are both syllable-based, konnakol places more emphasis on the numeric subdivisions (compared to bol’s focus on the drum timbres themselves. North and South Indian classical music are distinct traditions which, despite a common source, have been relatively separate for at least the last four centuries. North Indian music has absorbed more influence from Persian and Islamic colonisers than its Southern counterpart. Pandit Shankar was one of the first to bridge this ancient gap, along with his tabla player – the legendary Ustad Alla Rahka, whose son, Zakir Hussain, continues to explore new territory inside and outside both Shakti’s incarnations. Konnakol deserves an article to itself, but the concepts which underlie it are not difficult to understand, and can be followed easily once the syllables are intuitive (in McLaughlin’s words: ‘it’s incredibly easy, but it goes to the most sophisticated heights’). The approach’s strong emphasis on subdivision aids in composing or decoding any complex rhythm including those detailed above. Konnakol patterns are also explicitly vocalised in several Shakti compositions, including the introduction to La Danse de Bonheur, and the percussion breakdown in Get Down and Sruti (sampled by Chinese Man). For anyone who is interested I recommend McLaughlin’s and Selvaganesh’s excellent instructional video series, The Gateway to Rhythm. Shakti’s world of rhythm is a unique fusion of three complex traditions – Hindustani, Carnatic, and jazz, and the patterns I have noticed will only be a glimpse into all that is there. Nevertheless, I hope I have introduced some new ideas into your world of listening – Shakti have many to offer. The Reinvention of a Tradition: Nationalism, Carnatic Music & the Madras Music Academy 1900-1947 (1999). Subramanian L., Indian Economic & Social History Review, 36(1), p.131-163.